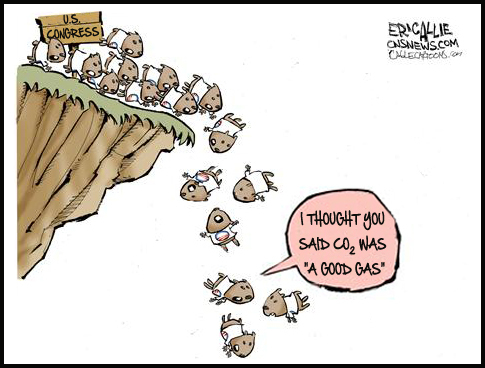 LEMMINGS – many prominent environmentalists have fretted that the ONLY thing that will ever bring about major legislation to address climate problems will be the eventual “stimulus-response” situation where, like a pack of lemmings, a massively painful stimulus (such as heat waves causing thousands of deaths) is applied to the population, producing the response of changed behavior to address the problem. The announcement in Russia by Medvedev last week that their heat waves causing thousands of deaths must be related to human alterations of the planet appears to be exactly this. Presumably such a situation will eventually happen in the U.S. (though not right now in California where the summer has been about ten degrees colder than normal). LEADERSHIP – this is what ought to be expected of a species of primates whose birth canals have had to widen over the ages to make space for enlarged crania. One would hope that before there are mass die offs, the smarter folks would be able to persuade the less informed masses to do something about the impending doom. This is what Mr. Gore valiantly attempted, but then was forced to grind out his frustrations with a book aptly titled, “The Assault on Reason”. This is why we have leaders. It’s called civilization. At some point we put our trust in those with that stuff called “knowledge.” Like the IPCC. It’s not perfect, but it’s our best shot at avoiding the lemmings scenario. There simply have to be more trials.